The intense yet smooth fragrance of a blooming lavender plant (Lavandula spp.) is unforgettable, evoking linen closets, sachet bags and Grandma's perfume. Even brushing against the foliage of most species releases a pleasant smell. 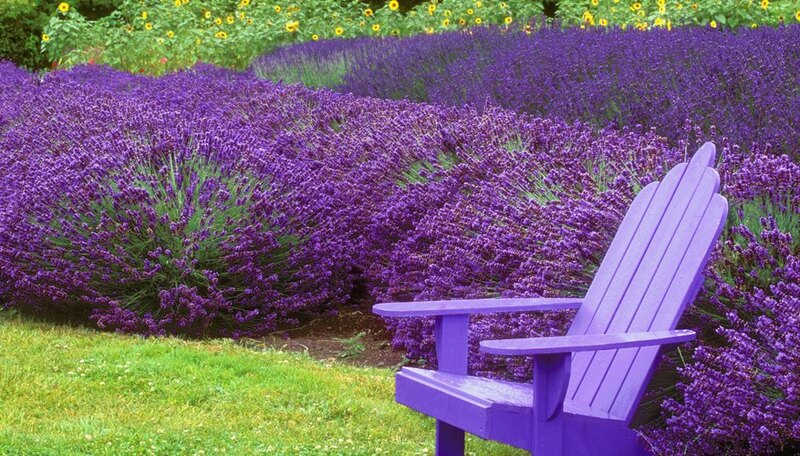 Grow lavender in the herb garden, in containers, and in borders or perennial gardens. Native to Europe and the Mediterranean area, numerous species and many cultivars exist. They differ in fragrance characteristics, flower and leaf color and the strength of the fragrances. 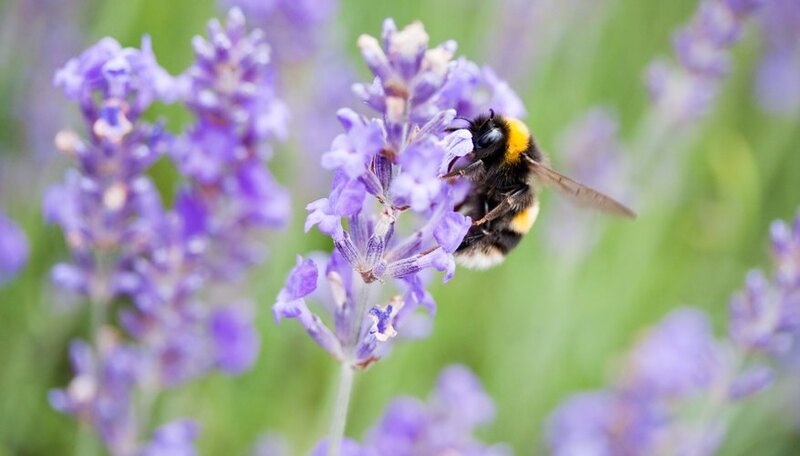 The best-known species, English lavender (Lavandula angustifolia) is a cold-tolerant lavender, hardy in U.S. Department of Agriculture plant hardiness zones 5 through 11. Plants grow 3 feet tall and wide. Although it originated in the Mediterranean, its common name probably comes from its ability to grow well in England. Both the narrow, gray leaves and purple, pink or white flowers have a strong fragrance. English lavender scents perfumes, soaps and cosmetics. It's also preferred for culinary use in flavoring foods. Cultivars include "Hidcote," "Munstead" and "Rosea." 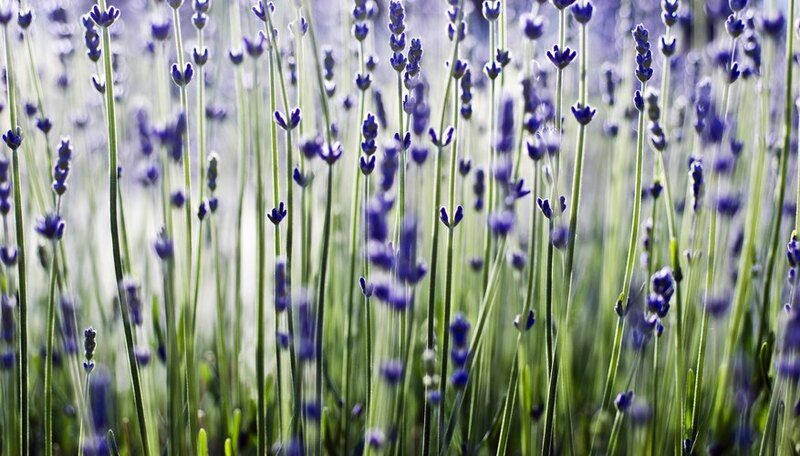 Harvest lavender flower stalks when flowers are one-third to fully open. 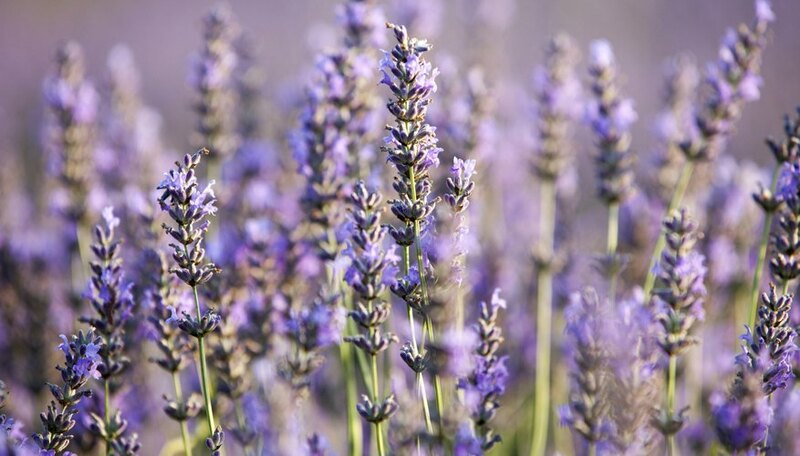 With a less intense scent than English lavender, French lavender (Lavandula dentata) is used mainly as an ornamental rather than in perfume or to flavor foods. Gray-green leaves are toothed and sweet-smelling. Flowers are usually light purple but vary with the cultivar. French lavender doesn't tolerate cold as well, growing in USDA zones 8 through 11 to heights of around 2 feet. Grown for its showy flower stalk rather than its fragrance, which is rather strong and piney, Spanish lavender (Lavandula stoechas) is hardy in USDA zones 8 through 11. Small, dark purple flowers are crowded together on a pineapple-shaped flower head that is topped by a brightly colored tuft of petal-like bracts. Bracts can be purple, white or pink. 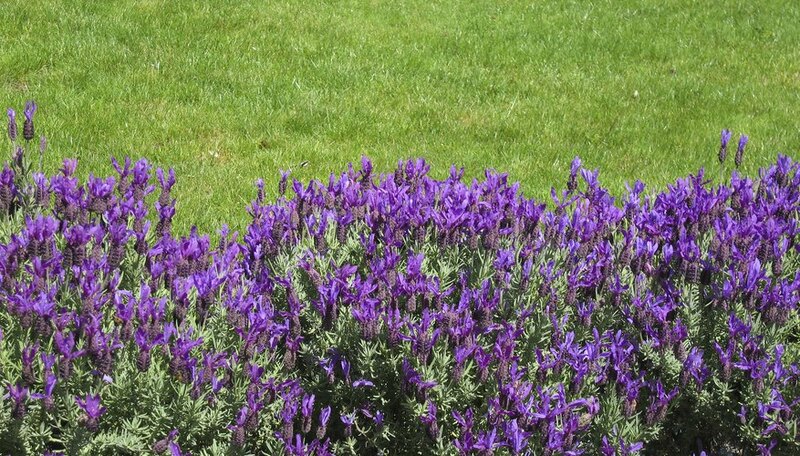 Sometimes called rabbit ear lavender or French lavender, this 2-foot-tall shrub has elongate, narrow, grayish-green leaves. Lavandin lavenders (Lavandula x intermedia) are hybrids resulting from crossing English lavender with spike lavender (Lavandula latifolia, USDA zones 6 through 9). 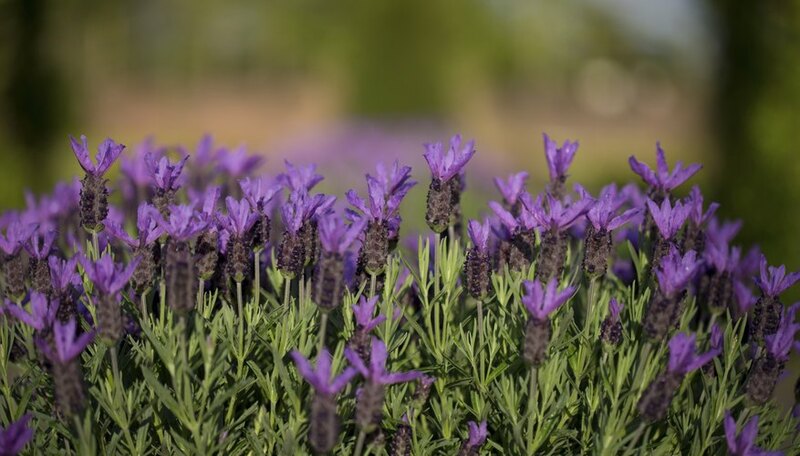 The 2-foot-tall hybrids combine the strong scent and high essential oil content of spike lavender with the cold hardiness and good growth habits of English lavender. The narrow, gray-green leaves are similar to those of English lavender. Lavandins are sources of essential oils used in perfumes, cosmetics and cooking. Hardy in USDA zones 5 through 9, varieties include purple-flowered "Grosso," white-flowered "Alba" and blue-flowered "Provence." Reflecting their origin in the hot, dry summers and mild, rainy winters of the Mediterranean area, lavenders as a whole need excellent drainage and are drought tolerant once established. Grow them in a raised bed if your soil doesn't have good drainage or you garden in wet, humid conditions. Plants need full sun for best growth and fragrance. Missouri Botanical Garden: Lavandula Angustifolia "Hidcote"
Plants for a Future: Lavandula Latifolia -- Medik. Plants for a Future: Lavandula x Intermedia -- Emeric. ex Loisel.